Sorry, but many American feel the same way. Obama just doesn't get it, winning re-election doesn't mean it came with a CROWN, in other word, you can't do what ever you want, when ever you want using executive power. Obama forgets we are a democracy and we are to follow certain rule and there are 3 branches of government. Congress does nothing for 4 years, so Obama takes unilateral action. For this they call him a tyrant. Go figure. I always find it curious that the loudest speakers upon preserving the U.S. Constitution and the Amendments have little comprehension of what is in it. The Second Amendment is a supplement to Article I, Section 8 of the Constitution. The Second Amendment speaks directly to the purpose of the the right of bearing arms as a relation to having a "well regulated Militia". Under the Constitution it is the power of Congress to set forth the regulations of the milita, as set forth under Section 8: "...To provide for organizing, arming, and disciplining the Militia, and for governing such Part of them as may be employed in the Service of the United States, reserving to the States respectively, the Appointment of the Officers, and the Authority of training the Militia according to the discipline prescribed by Congress..."
The effect of the Second Amendment was to leave the power of raising the personnel with the respective states. Therefore, the right to bear arms is protected to the extent that Congress may not discriminate between the several states as to who is permitted to lead and serve in the Militia. What Senator Rand Paul never discusses is what are the duties that the must be observed to uphold the right to bear arms. For every Right there must be a Duty. Keep up the good work Rand!! Keep talking crazy and even more people are going to leave the GOP. Eventually all that will be left are the die hard racists. The same ones that have been preparing for a fictional r a c e war since the 60's. I have never heard any of these people call any other POTUS a king. Not even when Jeb Bush assisted his brother in getting into the White House. this is amazing – instead of being in DC, he should be raising his son it sounds like – hows that assault charge going on your son Rand??? Extremists like Rand Paul are helping to make the Republican party extinct. Keep up the good work. I would have thought all this hyperbole for hyperbole's sake was done with after the lack of success during the past 4 years. Was this guy in Israel? Didn't he say something about not giving them any more money? I support our constitutional right to bear arms, but also recognize that we have a problem in this country with the massive number of murders that involve firearms. This is a time for serious consideration of the issues, NOT for more political posturing or fear mongering from either side of the debate. The president should set the standard for that dialogue, not make threats or take action to bypass the legal process regardless of how frustrating it may be. Likewise, congress better start acting like individuals qualified to find rational solutions to difficult national problems. Their job is to represent the citizens of this country – not their party or campaign contributors. Rand Paul and people like him that want to call the president a king or dictator need to go stay in places like Cuba, Syria, Somolia, and other 3rd world countries that have little or no government and dictators and see what it is really like. I have a feeling his kind would be begging to come back here even with Obama in office. As far as I am concerned they can STAY over there if they go which I know that don't have the guts to do. I wish I could take back both of my votes for this POTUS. Unbelievable. Senator Paul, should you choose to run for President in 2016, you will have this Indy's full support. I believe many liberals think this is a good idea. ================================================================================================ You support his opposition to a bill both you and Paul haven't even seen and know nothing about? I'd say that position makes you an outstanding candidate for President of the Rand Paul Fan Club! If it keeps the Republicans locked out of the executive branch and obstructs the TPs ideological craziness in the House, then I say Long Live King Obama!! Hillary will make a great Queen in 2016. Rand's idiotic statements that executive orders turn a President into a King are wrong and he knows it. Great historical changes have resulted from executive orders. For example, Truman issued an E.O. To desegregate our military. E.O.s have been used by all Presidents, so why do TP thugs like Rand feel Obama as a duly elected POTUS be the exception to this rule? Frustrated much there in TP Land? So Rand doesn't favor having a king........apparently he doesn't favor democracy either seeing as how he wants to do everything in his power to thwart the will of the people. I wonder what exactly he is in favor of.........hard to tell. Rand Paul is an unelectable whack job. By all means GOP, make this guy your nominee. Will be fun to watch Hillary destroy him. However in 1937 Germany(and Italy, under Mussolini for that matter).....their leader was an extreme RIGHT winger... Nazi = National Socialist Party, and NO Not the same as a Socialist... Think Neo-Nazi, Aryan Brotherhood, RIGHT wing Fundamental.... So if we are like 1937 Germany, then it's the Tea Party thats leading the sheep. Tell me who needs clips that hold 100 rounds. You say you want to protect America? Join the armed forces. Get all of the shooting and killing you want. I have a very close friend at the CIA who told me, under conditions of great secrecy, that Obama was about to send the military (not the Air Force – for obvious reasons) out house-to-house looking for guns and Bibles – both will be confiscated and the owners imprisoned. He will then require everybody to buy a Prius, shop at Whole Foods, watch MSNBC, wear Birkenstocks, adopt a gay lifestyle, and become a Muslim. Rand Paul is our only hope! He believes me! If our elected senators, congressmen etc. would actually do their jobs maybe the President would not have to use presidential priveledge . The first term of our president , he waited for the jobs to get done, this time around he is not going to be so patient, so Rand Paul and others like him should get the job done and then maybe they wouldn't have time to complain about everything. Ohhh, I think I am in love. A man that speaks the truth and stands up for what he believes in. 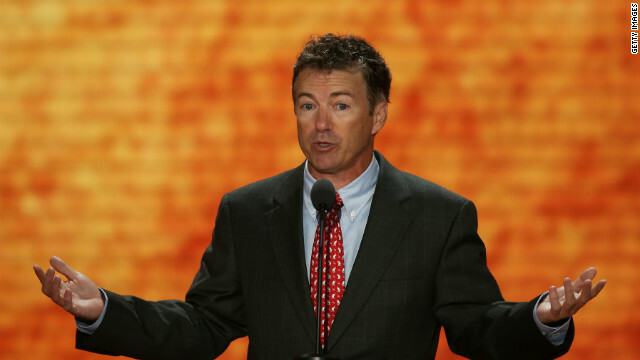 Rand Paul is against having a king unless he is the king. A hypocrite, like his father, criticizing the government while accepting government pay and full benefits.